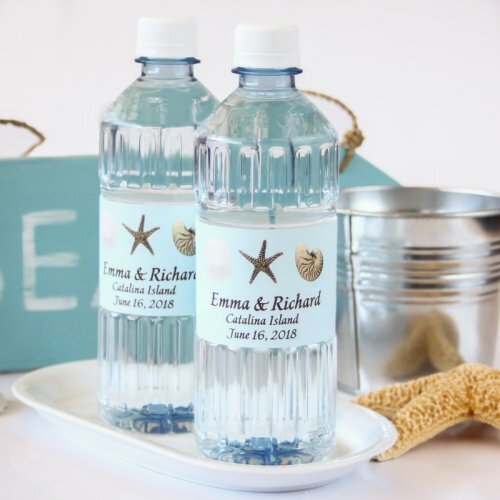 You can help your guests keep cool and hydrated at your outdoor summer wedding (at the beach, in a park, or in your backyard) with these fun personalized water bottle labels! Each case of 24 bottles of spring water can be personalized with labels that match your wedding’s theme or style. Choose the design you love and personalize it with your names, the date of the wedding, or even a heartfelt message for your guests. These personalized water bottles would be perfect for a beach wedding or an outdoor wedding, no matter the location. Your guests will appreciate the gesture! You can find these personalized water bottles here.